A tough little SUV, the Toyota Cami sure knows how to take a beating and keep on rolling. 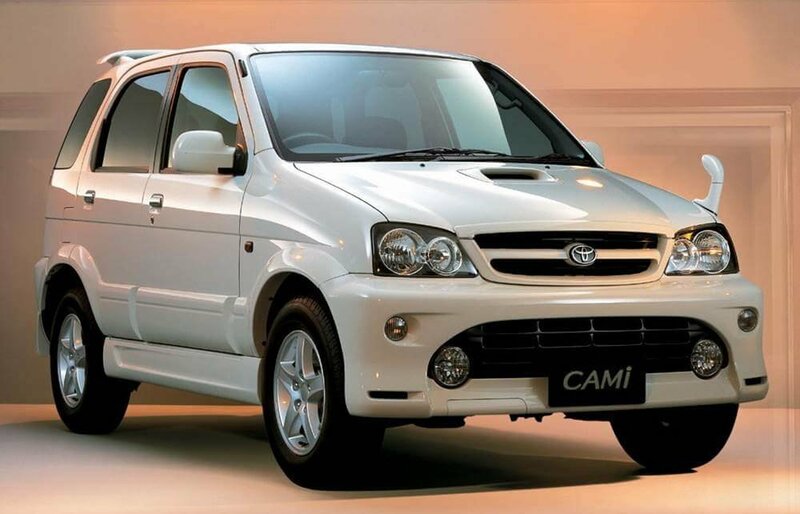 First released in 1999 as one of two offshoots of the Daihatsu Terios—the other being the similarly designed Terios Kid—the Cami was designed to be a mini version of some of Toyota’s larger SUVs through a partnership between the two companies. It’s smaller in most respects—its engine, body size, and style follows the compact format that Daihatsu favors with its vehicle. However, it boasts a lot of Toyota’s trademark safety and efficiency measures and actually has a rather positive safety rating that factored into the Cami’s popularity. Primarily marketed as a family vehicle, the Cami has been known to pack a bit of a punch in terms of engine strength. Due to a lot of positive reviews about the Cami’s ability to handle itself outside of city roadways, a lot of drivers tested its off-road abilities for themselves. For the most part, the Cami proved itself more than capable of handling tougher driving conditions. As a result, Toyota released a limited sports edition of the Cami in 2001 that had amped up its rough terrain maneuverability. It didn’t do as well, sales-wise, as its standard issue counterpart but the act proved that Toyota was listening to its customers. Those aspects were retained in the Cami’s successor, the Toyota Rush, which was presented as a second generation member of Daihatsu Terios and Toyota’s lineup. While the Cami was discontinued in 2005 and there are no new vehicles being released under the Cami model, used ones that are still available are still as reliable as they were when they first rolled off the lot. Their dependability and efficiency have continued to make it a popular option for drivers looking at mini SUVs. With regular maintenance, even the older Cami model years are able to keep going strong. The Cami does boast some comforts, but they haven’t stood the test of time as well as the rest of the vehicle has. When the Cami was first introduced, it was loaded with all the top notch bells and whistles of the time that Toyota could cram into it. A central locking system, full stereo, electric control over the windows and mirrors, and a fairly snazzy navigations system were some of the built-in features that were available in brand new Camis. However, they pale in comparison to the standard features found in current Toyota vehicles. Mainly, those features lack the quality and compatibility of their present counterparts. Toyota and advertisers made a lot of claims about the comfortable ride that the Cami offered drivers and their passengers. Most drivers agree that those claims are accurate…to a point. Drivers who were used to smaller vehicles tended to be a bit more positive about the comfort level of the Cami’s cabin, but they often agreed with other drivers that it was not best for long rides. Even with its proficiency with off-roading, the Cami is highly definitely a bumpy ride for anyone not in the driver’s seat. Due to the limited market that the Cami operated in when it was an active model—isolated to dealers only within Japan during its six year run—owners may find problems with repair work. The model was exported to other countries under a multitude of different names in addition to the Cami name, with associated, but minor, changes being made for each release. The variations have resulted in some owners having difficulty finding parts and knowledgeable mechanics when they need repairs or maintenance. Changes in location also shined a light on some flaws that were not as noticeable in Japan. Russian drivers and owners, for example, found that the Cami’s terrain mobility was significantly disappointing when it came to soft terrain, like snow and sand. It may be able to handle mountains without breaking a sweat, but the Cami can be dragged to a halt by six inches of snow on a paved street.